It’s time for BI that says Yes. Yes to the requirements of your budget, business, and business users. Yes to fewer compromises. This whitepaper first looks at the fundamental requirements that a BI solution should deliver to your company. 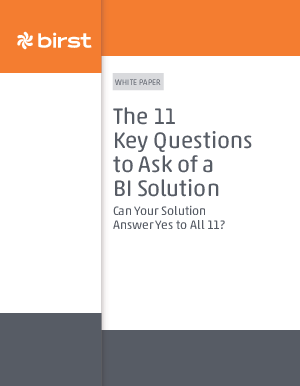 Next, this whitepaper covers the 11 Key Questions that you should be asking of a future BI technology partner. When the BI provider can answer Yes to all of these questions, you have BI that is capable of fulfilling your analytical and reporting needs both today and over time—it is flexible, powerful, and efficient. It is BI that says Yes.